The Nest Thermostat E is a fantastic consideration if you're in the market for upgrading your heating system to a smart one. It won't control hot water like the more expensive, hard-wired Thermostat 3.0, but that's the trade-off for a more affordable self-install model. The Nest Thermostat E was first introduced in the US in 2017 as a cheaper alternative to the more premium Nest Learning Thermostat 3.0. Now this smart thermostat is available in Europe, having been re-engineered specifically for our homes. The European version shares the same design, albeit with a built-in stand for more flexible placement. The Nest E has been controlling the heating in our home for a few weeks and this is why it should be high on your list if you're looking to upgrade your heating system to a smart one. All Nest products have lovely designs with premium finishes – and the Thermostat E is no different. It isn't as glossy as the more expensive Learning Thermostat (now in its third-generation guise) and it doesn't come in as many finish options, but it's still a beautiful device. Rather than the stainless steel circular shell of the Learning Thermostat – which comes in options including copper – the Thermostat E has a white circular shell that is soft to touch – like the Nest Cam Indoor IQ – and significantly more premium than you would be forgiven for initially thinking. It turns in both directions, allowing users to change the temperature quickly without the Nest app, as well as scroll through settings options and features. In the centre of the white shell is a 1.76-inch frosted glass display, which is much more subtle than the display you'll find on the Learning Thermostat 3.0. The frosted display blends brilliantly into its surroundings, presenting information like the room temperature when you walk towards it, rather than being the centre of attention all the time. At the bottom of the display is a Nest logo, which is where all the sensors are hidden, allowing for a clean, simple and streamlined look. These comprise temperature, humidity sensor, occupancy and ambient light sensors (the last of which is used to determine when is night time, but also when the sun is shining on a cold day for example, keeping your heating on rather than turning it off as it would if it was a hot day). There is then a power lead at the rear and the Thermostat E sits neatly on a weighty white built-in stand, allowing users to place it anywhere they like in their home, whether that be the bedroom, living room or landing – as long as there is a power socket nearby and it's within 30-metres of the Heat Link. The Heat Link E comes included in the box, to act as the replacement for your existing thermostat; think of the main Nest unit as the controller. Heat Link allows for greater placement freedom and it looks a bit like a Google Home Mini (apt, as Google is Nest's parent company). It is a little slimmer than the Google Home Mini and larger in diameter, but the resemblance is definitely there thanks to the fabric finish. The Heat Link E has a temperature sensor inside, so it acts as a second thermometer, allowing users to check the temperature in different parts of their home. This is a great feature if you place the Thermostat E in a separate room to the Heat Link as it monitors the temperature throughout a home rather than just in one room. We had our Thermostat E upstairs, while the Heat Link E was downstairs. There is also a physical button in the centre of the Heat Link E, which allows users to turn the Thermostat E on without the Nest app, as well as override any schedule. How easy is the Nest Learning Thermostat E to setup? Unlike the more expensive Leaning Thermostat 3.0 that requires professional installation, the installation process for the Thermostat E is very simple. When we were told the Thermostat E could be installed by pretty much anyone within an hour, we would be lying if we said we weren't skeptical – but we were pleasantly surprised. We managed to install our Thermostat E in 33 minutes from start to finish. And we're not electricians. It's worth noting that we had a new heating system and boiler put in to our home in 2017, so newer than what many may have in their homes. We also have existing Nest devices, which assisted in auto-configuring the Thermostat E to our Wi-Fi network, making the process very straight-forward. The Nest app offers step-by-step directions specific to different heating systems. And while the instructional YouTube video didn't work for us in the Nest app itself (we searched for it and watched it separately through YouTube), setup is pretty much fool-proof once you get started. As long as you know a little bit about what heating system you have – gas, electric, oil, propane, and so forth – and whether you have an OpenTherm system or not. For those with a programmer on their boiler, you'll need to switch it to be permanently on, while the Heat Link E replaces your existing wired thermostat. There are two wires that need to be connected to the Heat Link E. If there are any extra wires on your existing thermostat, there are some connectors in the Thermostat E box for those and the step-by-step instructions will tell you exactly what to do with all wires. Before you get started, ensure you have a compatible heating system, along with a power socket for the Thermostat E, Wi-Fi and access to the Nest app, which is available for both Android and iOS devices. You'll need a flat head screwdriver, Philips screwdriver (0.5mm x 3mm) and a power drill in case the holes of your existing thermostat don't match those of the Heat Link E.
Nest Thermostat E (UK) vs Thermostats 3.0: Cheaper but at what cost? Those with an OpenTherm system can choose a default hot water temperature during setup through the app – though we found during use that the Nest-recommended default temperature was a little too low for us. However, it can be changed on the Thermostat E itself after setup. It's important to note this doesn't mean the Thermostat E offers hot water control. Those after this feature will need the Thermostat 3.0. 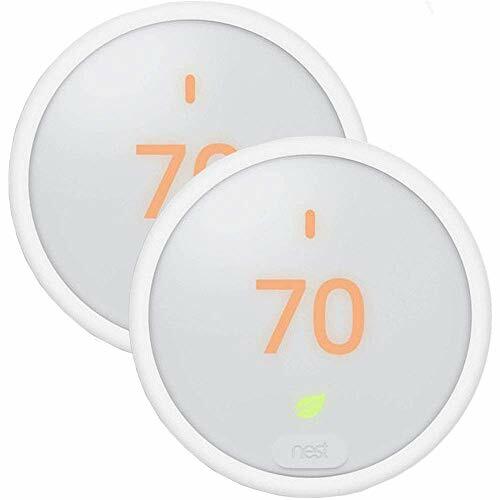 Despite its lack of hot water control, the Nest Thermostat E offers many of the same features as the Leaning Thermostat 3.0, including its learning capabilities. The Thermostat E therefore gets to know the temperature you like when you're at home, how your home heats up or how draughty it is, as well as turn itself down when you're away. The Thermostat E ships with a pre-set schedule, which has been created from the Thermostat 3.0's user data that's based on the majority. You can change this schedule to suit your own preferences and the Thermostat E will also automatically adapt itself around your life after a week of use, learning from you and your routine. We typically work from home so our schedule is a little different from most, all of which the Thermostat E has now accounted for. Like the Thermostat 3.0, the Thermostat E rewards you with a green leaf when you change the temperature to save energy. The leaf learns how to help you save based on your preferences. For example, if you typically like the temperature at 18 degrees Celsius when you sleep, you get a green leaf if you drop this slightly. You also get a Home Report every month to show you how much energy you use, including daily breakdowns in the Energy History section of the app. Additionally, the Thermostat E has a True Radiant feature that helps you achieve the exact temperature you want in the room where the thermostat is placed – because it knows how long your home takes to heat up, it knows when to turn off the boiler so your home doesn't get too hot. There is a safety temperature feature too which will alert you if the temperature in your home gets too hot or too cold. There are also standard smart heating features, like remotely controlling your heating from the Nest app. Nest also has a Home/Away feature, turning the Thermostat E to Eco Mode when you or your family aren't in the house. This is also where the occupancy sensor comes into play, ensuring your heating doesn't turn off if you have people in your home who aren't linked to your Nest account – like a babysitter, for example. The Thermostat E can be controlled through Google Home devices too, offering hands-free voice control through Google Assistant. It is also compatible with IFTTT – but currently there is no Amazon Alexa support. The Nest Thermostat E is a fantastic consideration if you're in the market for upgrading your heating system to a smart one. It offers an excellent design, a great set of features and it is easy to install yourself, making it a brilliant alternative to the more expensive, hard-wired Thermostat 3.0. The Thermostat E doesn't offer as many glossy finish options as the 3.0 and there is no hot water control or Farsight features either – but the E is not only more flexible in terms of its placement, but it's more affordable too. It's this balance of features, usability and price that'll make it a winner this winter. The Nest Learning Thermostat 3.0 offers the same features as the Thermostat E, but it adds hot water control and a feature called Farsight that shows information on the display from a distance. There are a few extra finish options, including copper, but professional installation is required and it is more expensive. The British Gas Hive Active Heating system allows you to control your hot water and central heating using a wall controller and thermostat, along with a hub to connect it to Wi-Fi. Like Nest, there are numerous other products available in the Hive system including cameras. Honeywell offers the Lyric T6R thermostat, as well as its more expensive Evohome system that offers multiple zone control. The Lyric T6R is the same price as the Nest Thermostat E and it has smartphone control and effective geofencing, but it doesn't learn your routine like Nest.